A challenging hike takes in the sad history of a mountain with a deep significance for many locals. We’re more than halfway up Le Morne Brabant when things start to get interesting. Faced by a rocky incline too steep for us to scale simply by walking up, our small group has come to a halt. Our guide, Yan de Maroussem, of Yanature, is explaining how to proceed. “You are going to need your hands,” he says. I’ll admit, when I was told I’d be climbing Le Morne mountain I assumed there had been some miscommunication. 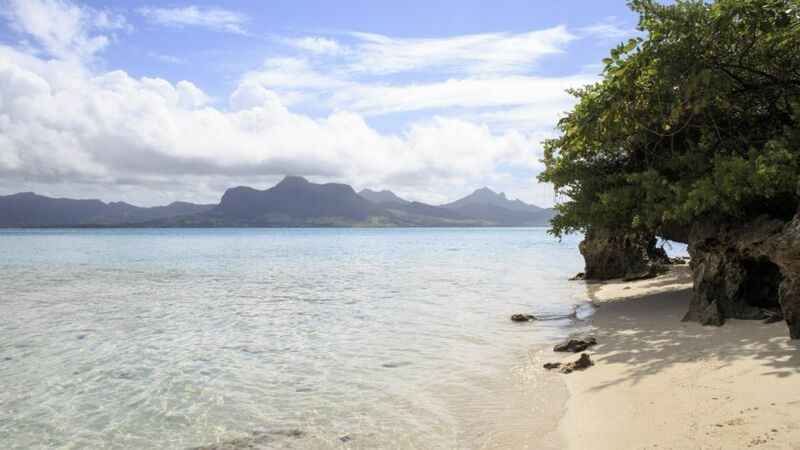 I’d seen the mountain, which rises intimidatingly steep and craggy from the coast of south-west Mauritius. What I hadn’t counted on was Yan, a man so fit he gives the impression of being ready to run a marathon at a moment’s notice and a guide sufficiently skilled I suspect he could get anyone with a basic modicum of fitness to the summit and back in safety. We’d set out earlier that morning, climbing through the bush under a clear, blue sky as the rising sun cast a glow across the landscape. Le Morne is significant for many reasons — the most important of which I’ll return to later — and one of them is its concentration of rare and endemic plant species, some of which Yan points out as we walk. We pause regularly to allow those at the back of the group to catch up and to admire the views, which are spectacular even on Le Morne’s lower reaches. Looking up, Yan shows us where we’re headed: a metal cross perched near the summit, just visible against the sky. “Now we can start to feel the mountain,” he tells us, as the climb gets steeper and more challenging. One member of the group, a young American woman, jokes that she can definitely feel her legs after a week spent hiking and scuba diving. “I love that feeling,” Yan says. Eventually we arrive at the final, tricky section. Yan has some advice on the practicalities of how we should approach the climb but also on mindset. Be in the present, he tells us. “Enjoy every moment,” he adds. It might sound a bit hippy-dippy but it turns out to be solid advice. Every time I feel challenged or overstretched, I focus on the task at hand: finding footholds for my hands and my feet, sometimes using the ropes secured along the trail to steady myself, gradually making my way towards our goal. Every now and again, I remind myself to look up — at the view and at the cross, which appears to grow gradually bigger as we approach. Finally, sweaty and hot under the warming sun, we reach our goal. The absolute summit of Le Morne, 556m above sea level, is a nature reserve and is off limits but this is a magnificent spot, perched high on the eastern side of the mountain. We can see the forests and mountains of the interior, the villages and settlements along the coast, the aqua of the fringing lagoon, the ring of white breakers along the reef and then the vivid blue ocean, stretching towards the horizon. The cross is here, too, its metal structure enclosing the remains of an older wooden version. Both are a memorial to Le Morne’s sad history — a history that continues to hold a deep significance for many Mauritians. As Yan tells us, in the days of slavery on the island, before its abolition in the 1830s, escaped slaves would hide in the caves on Le Morne’s western side. Some tried to build boats to escape to their homelands in Madagascar and Africa. And some are said to have leapt from the mountain if threatened with recapture. One well-known local story tells of a group of escaped slaves hiding on the mountain who tragically jumped to their deaths after seeing some soldiers approaching, not knowing slavery had been outlawed since their escape and that they were free. It’s stories such as this that have given the mountain its name: Le Morne, the Mournful One. The facts of some of this have been difficult for historians to substantiate — though, Yan tells us, evidence of human habitation has been found in Le Morne’s caves. Regardless, the cultural significance is substantial and in recognition of this UNESCO added Le Morne to the World Heritage list in 2008. And the cross? It was brought up here by Yan and some friends, who carried it up in pieces on foot. I ask whether this was difficult — it’s big and looks heavy — but he just shrugs: “Not really.” In 2004, he says, he led a local bishop, a keen hiker, up here so he could bless it. It had occurred to me on the way up that getting down might be tricky. But, when it comes time to head back, Yan — as always — has the answers. He directs us to take our time and to sit and shuffle along on our bottoms when we get to steep sections. It’s fairly slow going — not least because we’re all definitely feeling our legs by now — but no one’s in a rush. The sun’s shining and the birds are chirping. The bush is dotted with small flowers and yellow butterflies flit past. Back at the base, Yan tells us we now share in Le Morne’s story — “its history belongs to you, too, now you have been up there”. I look back up at the mountain, searching for the outline of the cross high on its craggy sides. I can’t see it from here but I know it’s there all the same. The land around Le Morne is privately owned but Yanature has access to take hiking groups through. The 3.5 to 4-hour hike with Yanature costs 1500 Mauritian rupees ($57). Yanature also offers a selection of other hiking, birdwatching and trail-running tours. trekkingmauritius.com. Local tour operator Emotions can help with organising day trips, including hiking at Le Morne. emotionsdmc.com. Air Mauritius flies direct from Perth to Mauritius twice a week, three times a week from July 7, and four flights a week during the peak summer period. It also has connecting flights to Paris, London and African destinations, with a free stopover of up to two nights if no same-day connection is available. Travel agents, airmauritius.com or 1800 247 628.